In the early First Era, Elsweyr was known to consist of sixteen independent realms that cooperated with each other for their mutual protection and economic benefit. Pellitine was one of the ports that traded with the burgeoning Imperial City. The devastating Thrassian Plague of 1E 2260 disrupted Elsweyr's delicate political balance, and when it subsided the original sixteen realms had consolidated into two survivors: Pa'alatiin and Ne Quin-al, or Pellitine and Anequina as they were known in Cyrodilic. 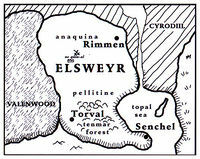 The two kingdoms fell into a bitter, often violent feud that stalemated for centuries; Anequina had developed a disciplined warrior culture, but Pellitine had wealth enough to hire mercenaries thanks to its fertile lands and the cultivation of Moon Sugar derived from the Tenmar Forest. The feud finally ended in 2E 309, as the kingdoms' rulers, Keirgo of Anequina and Eshita of Pellitine, married and united their realms into the Elsweyr Confederacy. While this move sparked a tribal revolt in Anequina that threatened to sunder the two kingdoms once more, Mane Rid-Thar-ri'Datta quelled the unrest by instituting a power-sharing system between the tribes and the nobility based on the phases of the moons Masser and Secunda. This page was last modified on 9 November 2018, at 10:21.